The National Citizens Alliance (NCA) is committed to an efficient and effective federal government, which includes balanced budgets and elimination of the national debt over a sustained period. The NCA believes fiscal responsibility is integral to the broad public good. The current national debt is $687 billion plus, with interest payments to commercial banks accruing at over $30 billion per year. Currently, the Canadian gross domestic product (GDP) is approximately $2 trillion. Therefore, Canada’s national debt is approximately 32% of its GDP. For every citizen to pay off the national debt, based on a population of 36 million, every citizen would have to pay almost $18,000. Between 2008 and 2013, Canada’s deficits averaged $28.04 billion. A deficit means that in a federal fiscal year more is being spent than is coming in. Federal deficits equate to increasing any existing debt currently held by the government. In just one term alone, the federal government will now add over $100 billion to debt, bringing it to around $750 billion by 2020/2021. Recent federal financial report projects that the country is heading for a financial disaster with the federal debt growing every year to at least 2055, and with the federal debt projected to reach $1.5 trillion by 2045. Major structural change away from the welfare government to an efficient and effective government that truly serves the people. The welfare entitlement governance is financially bankrupting the country and creating a growing dependency class of citizenry. This is all wrong. We need to be give Canadians a hand up, and not a hand out and down. The entire entitlement welfare system needs to be replaced with this efficient and effective government and a robust entrepreneurial private sector. We are talking about a change in the inherent concept of the federal government and Canada, and a honest, direct review of all federal entitlements in Canada. This change must take place to stop the massive and growing financial drain on the country. 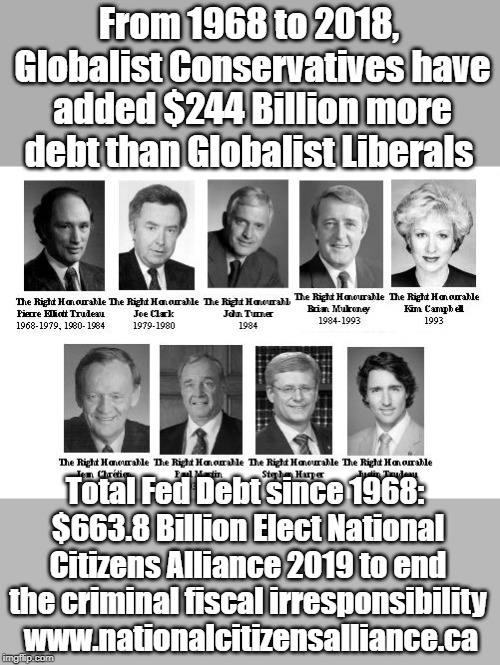 In addition, to the structural change, the NCA supports mandatory balanced budgets and paying off the growing debt by authorizing the Bank of Canada to pay off the federal debt owned to commercial banks and charge the Canadian people 0 percent on debt now owned to the Bank of Canada. However, mistake not, without structural change, talk of mandatory balanced budgets and paying off the debt are still mere distractions from the underlying financial realities. Further, the NCA supports earning revenue from non-taxable sources such as government-owned corporations. The NCA is committed to making government-owned corporations as profitable as possible. The NCA will nationalize or denationalize corporations to protect the economy and broad public good, and to raise additional revenue to lower the federal debt. Furthermore, the NCA encourage investment in the Northwest Territories in order to attain sustainable economic growth in this northern environment and generate additional revenue that would be used to lower the national debt. The financial facts do not lie: Canada is heading deeper into a financial disaster. For too long, the welfare nanny governance has wasted Canada’s great economic potential. In an increasingly competitive world, this unsustainable welfare governance must be replaced with a common sense system that rewards productivity, efficiency, and effectiveness, and takes care of those Canadians in true need. The NCA will work with any other parties that are serious about the financial disaster facing Canada. The NCA membership vote on 2014-08-7/8/9. The vote resulted in 100 percent of membership in favour of the Fiscal Responsibility Policy Statement with a 100 percent quorum. This vote outcome satisfies the minimum 70 percent membership support and 50 percent quorum required for adoption of policies as per the NCA Constitution.